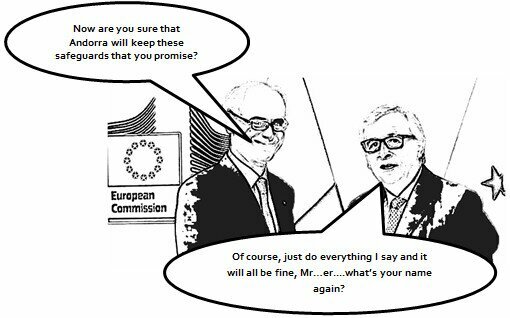 Andorra Elections 2019 are upon us.... Just as UK struggles with Brexit, what are the political elite`s intentions towards Brussels ?? What does this mean for Andorra and the EU ? There is a general misconception that Andorra is along with Monaco and San Marino in negotiations to become members of the EU together with all of the advantages or disadvantages depending on your point of view. Yes, negotiations are ongoing but they are aimed at securing an Association of the Micro states that the EU borders have inherited. These negotiations are not about joining the EU lock, stock and barrel but 3 micro sovereign nations seeking an Association to deal with and be accepted by their rather larger neighbour. It is intended that sovereignty will be retained over borders, Immigration, taxes and other major areas (Andorra already has a Customs Union with the EU except for Agricultural and some Industrial products). Whether you believe and trust not only the politicians but also that of the EU is another matter and that is where apprehension does lie as in the Brexit ordeal. The Liberal's policy would have been to cancel everything so far negotiated and start again, and the only Independent candidate running on the dream ticket of no EU and no Income tax only cobbled together a brave 4.64% of the National vote. So what was the policy back in 2015? In the last National and Parish elections in 2015 in spite of a charge by the Liberals the Democrats, the incumbent party headed by Tony Martí, secured another four years with an absolute majority. This allowed the Democrats to continue with their fiscal model with a view to ever closer negotiations with the EU. It seemed that the Liberals had secured the parish of Ordino thus denying the Democrats an overall majority, however at the final count the Democrats pinched Ordino with 17 votes and those two Consellers elected ensured the overall majority. Those of us who were expecting or who might have been hoping for a change in direction towards less taxes, less regulation and less integration to the EU must now wait another four years. There is talk during this Parliament of a referendum to determine the future relationship with the EU, this is yet to be determined. The Democrats have pledged that there will be no tax increases or new taxes introduced during the lifetime of this Parliament. The IRPF in its present format is here to stay other than superficial amendments. The turnout was disappointing with only a 65.6% turnout. This is about 8% less than 2011 in terms of registered voters. On top of the 65.6% that did vote, a staggering 6.61%, or 1,064 voters returned the blank slip in the voting envelope. This compares to 523 voters, or 3.22% using the blank slip protest vote in 2011. When one compares how close the country came ( 17 votes) to preventing an overall majority of the Democrats, the turnout and protest element shows considerable apathy in the democratic system. 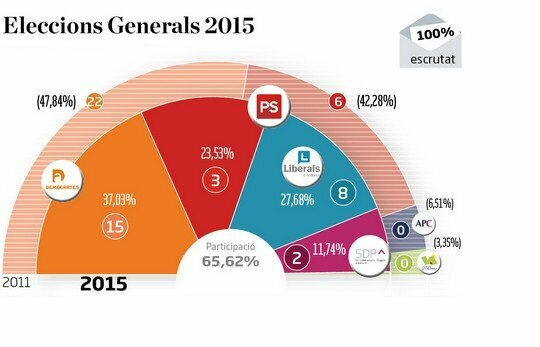 Election results and what they meant for the future of Andorra 2015. Toni Martin at the head of Democrats for Andorra (DA) has achieved an overwhelming majority with 55.15% of votes in the national list and a win in all parishes. The Social Democratic Party (PS) headed by the ousted Head of Government, James Bartumeu was left with 34.80% losing six seats and with the share of the vote down ten points compared to 2009. Eusebi Nomen APC has been left out of the General Council with a 6.71% and the Greens Andora Isabel Lozano returned 3.35%. Toni Martí, therefore, will be the next Head of Government for the next four years. The outgoing Head of Government of the Social Democrats Party, James Bartumeu, acknowledged they were aware of the difficulty of governing in times of crisis and the economic policies that have led to unpopularity such as information sharing or tax reform. 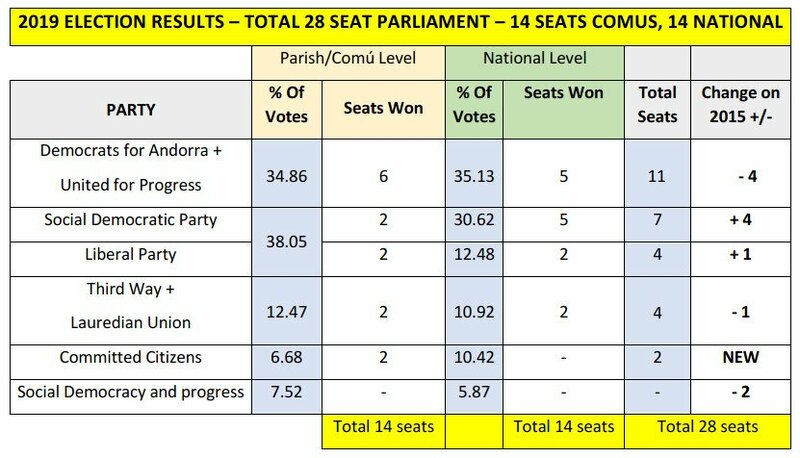 The Party lost 10% of their vote, and have lost territorial representation in all parishes. Democrats for Andorra won a landslide victory, taking every parish in which they stood and winning the national vote, giving them 21 out of the 28 General Council's seats, the biggest victory in the country's history. The Social Democrats lost all their parish seats and held only five national seats, while Lauredian Union returned to the General Council, winning the parish of Sant Julià de Lòria. Andorra for Change lost all their seats, and the Greens finished last, gaining no seats. "Europa ha de ser una oportunitat i no una amenaça per als ciutadans d’Andorra"
" Europe has to be an opportunity and not threaten the citizens of Andorra"
The party promises to be open and review accords made by the outgoing party. The party is good for business, tourism and above all immigration. One of the corner stones of their policy is to not only allow foreign investment here but to attract such investment.